This review explores opportunities and challenges in utilizing technology-mediated educational strategies for radiology education in parts of the world where attending radiologist support is limited. In efforts to increase the number of radiologists globally, radiology residencies have been established in regions where radiologists are scarce, several of which have partnerships with programs in other parts of the world. Technology-mediated educational strategies could leverage these partnerships to provide critical infrastructure to these recently established residencies. The efficacies of strategies such as teleradiology and teleconferencing in global radiology have been evaluated, as have the effectiveness of technology-mediated educational tools in radiology. 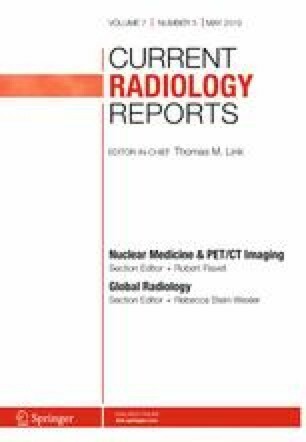 The topic of technology-mediated instruction for the newly established radiology residencies in other parts of the world has not yet been described or assessed, however. Technology-mediated education has potential in the expanding realm of global radiology resident education, but there are some important constraints in the execution of these programs. This article is part of the Topical collection on Global Radiology. Jennifer Lynn Nicholas declares no potential conflicts of interest. •• Sajedi P, Salamon N, Hostetter J, Karnezis S, Vijayasarathi A. Reshaping Radiology precall preparation: integrating a cloud-based PACS viewer into a flipped classroom model. Curr Probl Diagn Radiol. 2018. https://doi.org/10.1067/j.cpradiol.2018.07.014. This paper describes the strategy of flipping the classroom in radiology resident education. The UGFacts Team. Mbarara University School of Medicine Radiology Department 2019. https://ugfacts.net/mbarara-university-school-medicine-radiology-department/. University of Virgina. Educational Apps Help Radiology Residents in Uganda 2017. https://med.virginia.edu/radiology/2017/04/15/educational-apps-help-radiology-residents-in-uganda/. Miniwatts Marketing Group. Internet World Stats 2018. https://www.internetworldstats.com/. Trachtman L. For a Cloud PACS, how fast does my Internet access need to be? 2/4/2017. https://blog.purview.net/for-a-cloud-pacs-how-fast-does-my-internet-access-need-to-be. Purview. Purview Speedtest 2019. http://upload.securerad.com/mini/?__hstc=38471612.919f00cad5f44930a46cbf33186c8402.1547387558981.1547387558981.1547387558981.1&__hssc=38471612.1.1547387558980&__hsfp=457898507&hsCtaTracking=2b973448-bb97-4b97-94cc-51edf0754470%7Cd7f7c4c6-3d31-43a2-82aa-358c852ab7ed.